Svetlana Lomeva, Executive Director Svetlana Lomeva was appointed Director of the Sofia Development Association by the Sofia Municipal Council. She holds an MA degree in Political Science from Sofia University. She has been Deputy Minister of Education, Youth, and Science (2009 – 2010). 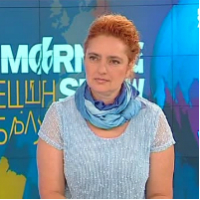 Mrs. Lomeva is one of the founders and Director of the Bulgarian School of Politics (2001 – 2009) and the Political Academy for Central and Southeastern Europe. She has been lecturer (2002 – 2010) and Director of the Center for Continuous Education (2003 – 2005) at New Bulgarian University.